A passenger rides the TransOeste bus rapid transit (BRT) system in Rio de Janeiro, Brazil. If a proposed amendment to the Brazilian Constitution gets passed by the Senate, he may be entitled to transport as a social right – along with the rest of Brazil’s citizens. Photo by Benoit Colin/EMBARQ. 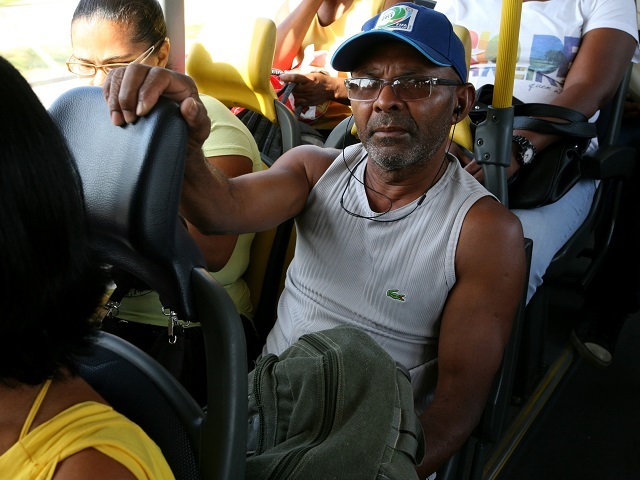 Urban transport is on its way to becoming a social right in Brazil. On December 4, PEC 90 – a proposed amendment to Article Six of the Brazilian Constitution that would define transport as a social right – was approved by the Chamber of Deputies. The next step for the measure to be written into law is for it to be passed by the Senate. Article Six currently ensures every citizen the right to work, health, housing, and education, among other core social necessities. Including transportation in this list is an intuitive step forward, since citizens require transport to access the other rights already established. At the time of the first vote on PEC 90 a few months ago, TheCityFix Brazil spoke with João Alencar Oliveira Júnior to better understand the proposed amendment. Alencar is a transportation engineer, lawyer, and an expert on PEC 90. In light of the recent, groundbreaking vote by Brazil’s Chamber of Deputies, we wanted to share that interview with all of TheCityFix readers. João Alencar (JA): The concept of “urban mobility” carries with it the concept of enabling access to the other rights guaranteed in the Constitution. This right does not only refer to motorized transport. For example, keeping sidewalks in good condition, high-quality pavement, and managing slopes are also necessary conditions for enabling mobility. So this policy refers not only to public transport in cities, but the broader concept of urban mobility. Is non-motorized transport also encompassed by this policy? JA: Yes. The technical perception people have is that you cannot restrict public transportation. We must consider non-motorized means like bicycling as a mode of transport, as well as walking. All of these elements contribute to advancing the discussion about how to raise the quality of life in cities. What, then, can we understand as included in the social right to”transport”? JA: The proposal is very general, since it only delineates one genre of transport – and it does not specifically refer to urban transport, which encompasses mobility not only within cities but within greater metropolitan areas. Who is responsible for clarifying what “transport” means? Is there a connection between PEC 90 and Brazil’s Urban Mobility Law? JA: Constitutional amendments to Article Six of the constitution are understood as programmatic rules, which require policies. One of those policies is the Law of Urban Mobility, which should be adapted upon implementation to local conditions. For example, urban mobility solutions in São Paulo will not be the same as those in Belo Horizonte, nor Fortaleza, Iguatú, or Ceará. Realities of urban mobility on the ground are different in each of these cities: Their urban dimensions, specific characteristics, and income levels of the population are all unique. That’s why there’s a need to translate federal rules to local environments. Where does the issue of zero fares, the subject of many recent public demonstrations, fit in to the proposal? JA: There is no free transport. What we forget to address when talking about this issue is that today, 40% of the demand is met by vouchers, for which the average worker pays about 6% of the cost. The remaining 94% is borne by the formal economy. No one remembers this aspect of the issue. Another valid concern is the artificial demand free shuttles would generate. Think about it this way: if one person needs to travel a mere two or three blocks to go to a shift at work, that trip could be done on foot. Maybe another individual needs to travel two or three miles, but to address the needs of both users we would need to increase the fleet. Of course, expanding the fleet increases the cost of the system. We have to be rational. Do you believe that social mobilization in favor of high quality public transport, PEC 90, and efficient urban mobility can contribute to reduced car use? JA: The dominating car culture must be confronted In order to do that, all options need to be put on the table. It’s already been proven that you can reduce the rate of private motorization by improving public transport systems through means like increasing exclusive space for buses through dedicated lanes, and lowering travel times for passengers. The role of the car is central to this discussion, because its status as the primary mode of urban transport is unsustainable. This blog post was originally published in Portuguese on TheCityFix Brasil.